The fifth Author Earnings Report was released this week, and it tells a starkly different tale about the state of the ebook market. As an independent survey of the ebook market, the Author Earnings Report is often a useful tool for cross-checking the industry surveys. It has its issues (I don't trust the revenue figures) but each report has proven useful at telling us about the relative shares of the ebook market; what's more, this time around the report delves into the prevalence of ISBNs. 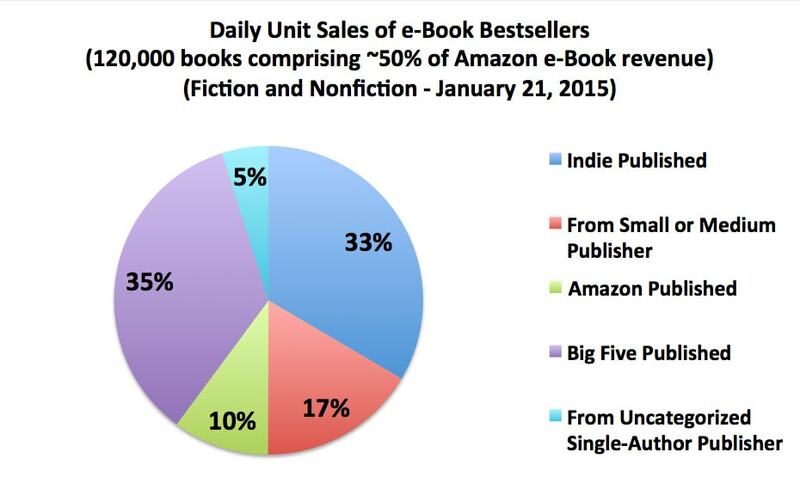 That's a lot ebooks sold by a segment of the industry which didn't exist 10 years ago, but that's not the best part. No, my favorite part of this report is the section on ISBNs. A lot of industry reports are based on the assumption of ISBNs being used throughout publishing as a standard identifier for books. A book without an ISBN is difficult for Bowker and other companies to track, and now we have an idea about just how much is slipping by without being counted. The numbers folks behind the Author Earnings Report checked all 120 thousand titles which made up this survey group, and they found that 30% of the ebooks sold in the Kindle Store lacked an ISBN. That means that any market estimate dependent on ISBNs could be off by a minimum of (3/7) 42%, and it could worse than that. There's no way to know for sure, but at least now we have a better understanding of what we don't know. Kinda explains why the “official” numbers show ebook sales “plateau-ing” or even (snicker) declining: they’re not counting Indie and micro-press ebooks that, wisely, eschew Bowker’s unnecessary shakedown (as high as $150 per book). Where they see single digit growth at best, we might still be seeing 20-30% growth in reality. This myopia is reflected in this week’s panic of “declining” SF sales. (As pointed out in this morning’s caffeine fix.) Last summer, AE looked at indie ebook sales by genre and found that something like half of SF ebook sales were indie. (Romance came in at two thirds or so.) Where they see a declining genre, the view minus the ISBN tunnel vision shows solid growth and a migration away from the expensive BPH imprints to the cheaper indie realms. Odds are, people are reading a whole lot more SF than ever before. “The numbers folks behind the Author Earnings Report checked all 120 thousand titles which made up this survey group, and they found that 30% of the ebooks sold in the Kindle Store lacked an ISBN. Seems to me that there is a slip in your logic here. It’s fine so far as NUMBERS sold is concerned, but the DOLLAR figures are more often cited and of greater interest to many. And in fact it appears that on average ISBNless bestsellers sell for little more than half as much as their ISBNed competition. We see that in http://authorearnings.com/wp-content/uploads/2015/01/shadow-bar-gross-dollar-sales.jpg. 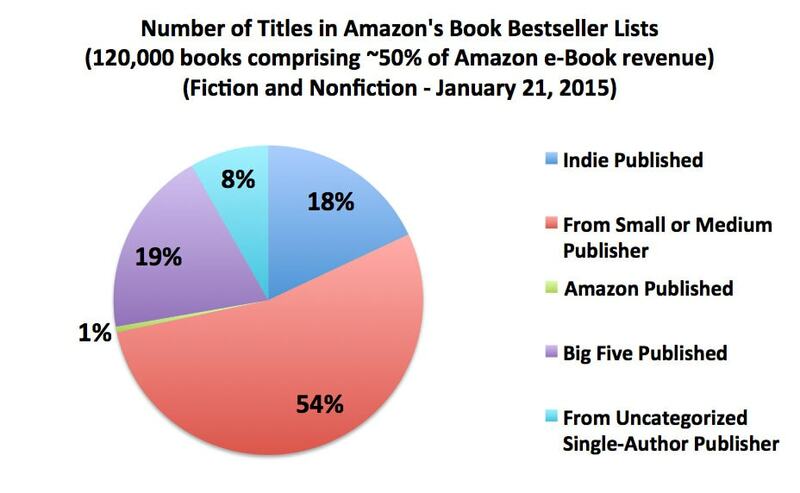 And what about the worstsellers, the vast majority of titles that don’t make the bestseller lists? I’ve never published a bestseller and quite possibly never will, because I’m not doing genre fiction now. But I do write books that sell for a lot more than most genre fiction titles and thus can make me significant money without hitting the bestseller list. Moreover, I know that many of the more profitable Big-5 titles are also not “bestsellers” by the definition used by the AER. So yes, it’s a terrific report and a great service. But there’s much more to the story. The AE reports aren’t about profitability or who is better at squeezing readers for money. At heart the reports are about channel efficiency; which publishing channel is most efficient in getting books to readers and income into authors’ pockets. The recurring theme is that most of what tradpub brings to the table is chaff. The terms, conditions, restrictions, and misconceptions that legacy channels rely upon more than cancel out the few positives. It is a channel with very few net winners and a whole lot of net losers. So far each report has shed light on a different aspect: currently, it is the folly of relying on ISBNs in calculating sales. Last fall, on the relative ineffectiveness of most non-BPH tradpub in capturing revenue for their books. Earlier on the relative ineffectiveness of all tradpubs in building the careers of new authors in the ebook era. As Nate said, the dollar numbers and ratios by themselves aren’t necessarily gospel, but they shed light on more interesting things that go beyond the earnings themselves. ISBNs for Kindle eBooks don’t provide any value to authors, and they can be pricey. I’m surprised that there are so many that do have ISBNs. Pretty much from the beginning of eBooks, it’s been clear that ISBNs don’t really have a place in the eBook world. And that they’re useless for sales data analysis. But, as the article points out, that hasn’t stopped the folks who sell data analytics. Kindle no longer shows ISBNs on KDP books, period, so all Author Earnings shows is that 30% of the books surveyed were KDP titles, which would include many small and medium size presses using KDP for their uploads. I’m not sure when the change happened, but I think I first noticed about six months ago. The ISBN does get plugged into their search engine though, so search by ISBN still brings up the corresponding book. I’m pretty sure Amazon stopped showing ISBNs to make things harder for Nielsen et al to survey the KDP market. That I did not know.I’ll forward the info to the data guy so he can respond. Edit: The data came from the API, and not from scraping the page.